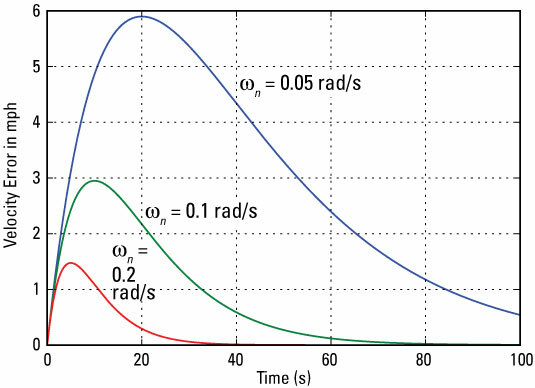 (critically damped, meaning the closed-loop poles are repeated on the negative real axis, and ωn takes on values of 0.5, 0.1, and 0.2 rad/s). Velocity error results can be found in the following figure. You see that at hill onset the vehicle velocity error begins to rise, meaning the actual vehicle velocity is falling below the set point value. Over time, the cruise control responds increasing the throttle setting to correct for the hill disturbance, and the velocity error drops to zero. If you increase ωn the control loop response time decreases, thereby lowering the velocity error when the 4 percent grade onset occurs.